It will be no surprise to readers of Shuck and Jive that I am not too swift when it comes to theological speculation. Over the years I have developed a fondness for the Trinity, and I confess the Trinity as an article of faith, and I use Trinitarian language in worship, even though I have no idea what I am doing at the conscious level. I get turned off when metaphors are pushed beyond their power to be evocative. Explaining the Trinity is kind of like explaining a joke. 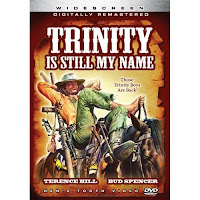 I don't mean to say the Trinity is a joke, what I mean is that you "get it" or you don't. It is language that either resonates with your experience or it doesn't. No amount of explanation helps me very much. We can look at the historical development of the doctrine. It is interesting to see how the church ancestors tried to figure out how Jesus fit into the scheme of things. Three "persons" in one and so forth. Throughout the speculative and political struggles, one explanation after another was shown to be "wrong." Finally the Nicene Creed got it just right and anyone who thinks differently is out of the club. It is all so much speculation. Speculation about what? The ultimate theory of everything? The nature of whatever it is we are thinking when we call what Is, God? Whatever it is we are talking about, we are using human language and thought forms. We are using metaphors. As much as I get a kick out of these conversations with Bob, I don't think anyone reading or commenting is missing the subtext of these conversations. We are talking about power. Who gets control of religious language? Who gets to say whose metaphors are correct and whose are incorrect? It is about drawing lines of who is in and who is out. Of course the big struggle is over the clergy, because ultimately they are the ones who control the language. It is therefore important to keep the right clergy in and keep the wrong clergy out. We are no longer searching for Truth, if we ever were. We are fighting for control over who gets to claim the name Christian and subsequently its institutional power. Just thought I would add this as my attempt to name what is happening in the Church and what has always happened in the Church. Now, back to the Trinity. The metaphors for God in the Trinity, Father and Son (Spirit, also traditionally understood as a Him), is male language. We have then, of course, the problem of patriarchy. When God is male, the male is God. The Trinity paper, God's Love Overflowing, was a mild attempt to introduce other metaphors while still hanging on to the symbol of three in one. I do find that the Trinity resonates with my experience of God. The symbol of three is very powerful. Also, the sense that the character or the heart of God is found in the person and work of Jesus. The love of enemies, justice for the poor and oppressed, and reconciliation of division, that Jesus proclaimed and lived is what God is like. This Truth and Goodness is also within and among Creation through Spirit. I don't think anyone reading or commenting is missing the subtext of these conversations. We are talking about power. Of course we are. That's what it boils down to. When someone says that belief in the Trinity is an essential of the faith, that person is defining who gets to be excluded from the faith community. The same goes with any other alleged essential of the faith. It's all about who you get to exclude. And when pastors are threated with, or even subjected to, witch hunts for advocating panentheism or a non-literal interpretation of the resurrection or whatever the Thoughtcrime du Jour happens to be, we know once again that it is about power. In your denomination, hanging the Presbytery over someone's head is clearly one tool in this endeavor. The doctrine of the Trinity is definitely wrapped up in a history of the exercise of ower. The Nicene Creed was the result of a long period of struggles, of violence, and of Roman imperial intervention. Had a few votes gone a different way, modern Christianity would now be Arian. But it didn't go that way, and all the pre-Nicene diversity within the faith has been written out of existence. This diversity of thought that existed within early Christianity was ultimately suppressed by the exercise of power, as dissidents and anyone who dared to think differently from the party line were crushed out of existence in Roman times, such that over a millenium later, during the Reformation, rejection of Trinitarianism was still a punishable offense. As I like to point out, that great Reformed hero Calvin participated in the persecution of Michael Servetus for the Thoughtcrime of not accepting Trinitarian dogma. I have no problem with you being a Trinitarian, John. I have no problem with anyone being a Trinitarian. Unfortunately, so many of the orthodoxy will not extend the same respect to those of us who think differently. It really is about power, as you say--who gets to decide who is and isn't a Christian. Trinitarianism isn't my bag, I don't agree with it, I don't think it is logical. But I would not try to exclude someone from my community of faith for believing in it. The intolerance that underlies so much of Christian orthodoxy is what I find objectionable. If Christians don't want to have me as part of their community because I dare to have opinions of my own, then so be it. I liked the discussion of metaphor here. I remember a while back during the Trinity paper, when one of the conservative theologians insisted the Trinity is NOT a metaphor. He said an expression like "shepherd" is metaphorical, but that God actually IS our father. I think what we will probably find is that certain things are normative in the Christian church but it will be too challenging to try to define them as essential. The Trinity is pretty basic to Christian faith. It should be taught in our seminaries and churches and lived in our congregations. It is a logic of relationship that structures our liturgy, our history, and our life. It is a normal way of speaking of our relationship with God. All of this said, it has been interpreted differently in different times, and our understanding of the trinity today grows from this earlier language and builds on it. 1. Yes, the early Church did go through a period of trying to find the right language to talk about Jesus. It extended beyond Nicea to Calcedon. I'll talk more about Calcedon in a later post, but what I really love about it is that they Synod finally answered a bunch of questions about the divinity and humanity in the negative. "We confess that one and the same Christ, Lord, and only-begotten Son, is to be acknowledged in two natures without confusion, change, division, or separation." It's almost as if they said, "we can't exactly put into words how Jesus is fully divine and fully human but we sure know what words are wrong!" 2. Power. Of course theological discussion will always have the aspects of power. Or maybe I should say that the decisions of Church synods and councils, (to use the Westminster language) have aspects of power. A presbytery uses power when it decides who shall be ordained and who shall not. A PJC also uses power when it decides that a pastor has abused his/her power by committing sexual misconduct. We need to be concerned not so much about power itself but about how and when we use it. As for power in this conversation, I'm only one person. I can say that if one does not believe in the Trinity then one is not Christian. But by doing so I do not exercise power over anyone. I only express my opinion. As you know, in the presbyterian system the session and the presbytery make such decisions. At a presbytery meeting I may exercise power by speaking and voting. Nevertheless I know that as we talk there are those who watch, waiting for one of us to say something that will get that one in trouble. I know that there are more looking to for you to commit heresy but people are watching me too. Making a distinction between names of God and analogues for God is a touchy subject in the PCUSA. Now Bob, I don't think anyone here believes that power is in and of itself an evil and that there should be no power within the government of the church. No one thinks that a governing body should not have the ability to remove the child molester. What I think that John and Mystical Seeker and I object to is the specific use of the available powers to gain a political advantage in the church. Properly used, the powers granted bodies by the Book of Order should be used to build up and maintain the church as a community of faith. Improperly used (by conservatives or liberals or anyone else) to advance a political agenda is dangerous. The pushing of "essentials" and attempting to squash the principle of scruples looks very much like where the Church was in the 1920s. The clamping down on our historic principle of freedom of conscience (and using terms of "tradition" in an Orwellian fashion) is antithetical to the very foundation of American Presbyterianism. I don't mean to sound hysterical, but history has shown that going down this particular road of clearly defined "essentials", or "fundamentals", is divisive and destructive. We have seen this movie before, and it doesn't have a happy ending. See my response to you as a comment on my past post. But let me ask a related question: The Kenyon decision in 1975 defined willingness to ordain a woman as an essential. While I think that the decision was faulty in its legal reasoning I believe it is essential for Ministers of Word and Sacrament and Elders to be willing to ordain women. Aren't there some things that are always essential? Do you have any evidence for stating that churches with clearly delineated essentials are self-destructing? I would posit that the last 40 years has shown that the clearer a church's commitments to the core doctrines of the Christian faith (as expressed in the ancient creeds) the greater has been their growth and efficacy. Let's also not forget - since we're dancing around "power" - that many people will seek to silence dissent over the disregard of core principles if it will keep their retirement and compensation packages safe. And people of all stripes in the PC(USA) are guilty of that. If you are a father biologically you of course are really a father. One could hardly say it is a metaphor but a title. God is Spirit, and he is the true Father of Jesus Christ the Son, not in a biological way however, but this doesn't change his title into a metaphor. And yes God actually is our Father, and this is the reason: He is the Father of Jesus Christ and when we are adopted into God's family through Jesus Christ he becomes our Father as he is Jesus' Father. That is different than God's fatherhood because he created us. Instead we share this wonderful relationship to the Father because we are united to Jesus Christ. Chris, absolutely I have proof. Read up on J. Gresham Machen. American Presbyterianism still has not recovered. BTW, looking only at individual congregations doesn't address the problem. I can show you numbers for churches in my own presbytery with strict fundamentals that have grown and those that have shrunk. I can show you what you might characterize as "liberal" churches that have exploded with growth and those who are getting smaller by the month. It's also disingenuous in the context of this conversation, as congregations don't ordain ministers, Presbyteries do. We are a connectional church, and what happens in one congregation or one Presbytery can have a rippling effect through the entire denomination. Schism is destructive to the Body of Christ, and in my own personal opinion, fomenting schism is sin. Trust me, I've been tempted, but in the end, the Church is too precious to me. Bob, my personal opinion on the Kenyon case is not a detailed one, as it occurred in the Northern church shortly before I was born (so I'm unfamiliar on two counts). However, this would fit into my scenario of power used appropriately. At the end of the day, Walter Kenyon promised to violate specific portions of the Book of Order in such a manner that would undermine the fundamental interconnectedness of the Church. It was not in the interest of the UPCUSA to have two classes of ordained clergy, one that wouldn't recognize the other and another that had to recognize both. My understanding is that this decision was based on issues of governance, not theology. As an aside, the church I grew up in split in the 80s when a woman associate pastor was installed, and it was an early lesson for me in how nasty Christians can be to each other. Look not just at Presbyterianism... look at the broader picture of American Christianity. Where are the dominant voices? What form(s) of Christianity are exploding with growth in the 3rd world? Are they evangelical? Fundamentalist, even? At least confessional? Yes...the Bible PC/Orthodox PC has been pretty static. But the other movements of the PCA and EPC have experienced explosive growth. It'd be interesting to look at the ARP, as they have been on our soil as long as the PCUSA and its predecessors. You say that what happens in one place effects another. What effect does heresy have? What effect does refusal to discipline ministers who arrogate to themselves abilities that the larger body has denied them? The Kenyon Case said in part that the ordination of women had become an essential belief. This was then modified in a case in Florida in which a minister coming from another denomination said he didn't believe in ordaining women or in baptizing infants but would do so. The GAPJC said he must be received because he was willing to do the right thing even if he didn't believe he should! This is how the PCUSA came to the conclusion that obeying the Book of Order is more important that believing correctly. And BTW, if you believe Kenyon is correct and should be applied in all cases then you must also believe that the 2006 Authoritative Interpretation (Recommendation #5) is incorrect. At least members of the Task Force told me that Kenyon could be ordained under the Authoritative Interpretation. On the other hand, if you believe that Kenyon cannot be ordained in the PCUSA then you have to also say that G-6.0106b must also be obeyed. After all, it too is part of the constitution and if not obeyed would develop two classes of MWS, one that would obey G-6.0106b and one that would not. It's a problem isn't it? And the really interesting thing is that this all started from a conversation about the Trinity! As long as the overall number of church members in America is dropping, not just as a percentage of the population but as an absolute number as well, nobody should be taking credit for church growth. Christianity in America is going out of style, and the louder the Fundamentalists get, the more out of style it is getting. For every person that joins a big growing "Evangelical" church, five people leave the Church altogether in disillusionment, despair and frustration at all the b.s. the Church has come to represent. Even those big churches that are "growing" have prodigious turn-over rates. So no, you are using a false metric and it is leading you to draw false conclusions. If by "3rd world" you mean South America and Africa, the Evangelical missionary movement of South America and Africa is modeled after the British and American movements of the 19th and first half of the 20th Centuries. Those missionaries used to write home about the thousands of souls they had saved for Christ, so much that if you added them up altogether you'd have more converts than people living on the planet. Overall they too have a lowering percentage of practicing Christians, and that is the only number that really matters. Yes! It was Purves--I couldn't remember exactly. But I'm still not convinced. I don't think theologically a "title" is better than a "metaphor." At best it is a description of what one does (and at worst it can be yet another type of modalism: the "job" of the father is to create, etc.) For me the point is that there is still such a gulf between what we mean when we say God is father and what we mean when we speak of a human as father that it is surely metaphorical. The human word "father" explains, in a limited way, who God is. I love its relatiionality, but the word is not exhaustive. And we also have to then relate how this metaphorical title is similar to other titles. Is Father more descriptive of who God is than creator? Is son more descriptive than Word or Prince of Peace or God with Us? I remember Purves's example of a limited metaphor was "I am the Good Shepherd." He argued that shepherds kill their sheep, etc., etc; but as I noted there are clear differences between how humans define a father and how God is. I do believe the Trinity is true, but it is still mediated to us through words, which will always be partial and largely metaphorical (or at least analogical). I find this pretty dismissive of third world Christians. Have you had any experience with them? Check out one of Philip Jenkins books on world Christianity and give it a read. Christianity outside of the west is growing at a breakneck speed, although it looks very, very different from either mainline US or even missionary Christianity. People don't believe this because they are stupid or uneducated; they believe it because it changes their lives and gives them meaning. All the talk of membership growth or shrinkage as if it were meaningful in the slightest is very interesting. It never fails but every side points to the thing they hate about the other side and then blames it for the woes of the church. Membership figures are complex and can't be blamed (or credited) to any single aspect of a church's life. Jodie is right, overall attendance in the US is going down and most "new" converts are actually stolen from other denominations so there is really no net growth in the US. Elsewhere there is growth going on, but it is mostly in pentecostal branches of the church which by and large are completely un-confessional (Chris). In any case, "success" defined as membership growth certainly cannot be our measuring stick for anything theological. The followers of a crucified savior should have no expectation that doing it right will mean worldly rewards, nor that doing it wrong will be punished in a worldly sense. Faithfulness, not success is our yardstick - which different people define differently. So we don't get a quick easy way out of the conundrum of how to proceed forward. We have to wrestle it out together. Power dynamics are crucial in every discussion and I would say certain types of power ARE inherently evil and don't belong in the church. Coercive power - the use of force, is completely impossible for a disciple of Christ. We have the power of persuasion, the power of love to overcome sin, and the power of life in the midst of death. Incidentally, I would say you haven't really discovered the depth and beauty of scripture until you've understood it in a trinitarian mode. It's the difference between seeing a 4x6 photograph of the sistine chapel and stepping into the sistine chapel. No comparison. I am bi-cultural and was raised in the "3rd world". What is dismissive to us in the so called 3rd world is to be called 3rd world. What the heck is >>that<< supposed to mean? Some of us were there long before you were here. My comments are from first hand experience on both sides of the fence and documented. But I have no ax to grind. I'm just saying things are not so neat and tidy. You don't need to convince me that the Holy Spirit changes lives and gives people hope and meaning. Read my post more carefully. I am arguing with the Fundamentalist delusion that they are the keepers of the faith and that there are statistics to back them up. Both claims are false and the opposite may just as well be true. You did suggest one thing I would agree is true. Americans in general have no idea what is going on in the rest of the world and don't give a damn - in the church or out - unless it suits some internal agenda of their own whereapon they make up their own idea of what is going on. Don't even get me started. As I have indicated repeatedly, I am unfamiliar with the details of the Kenyon case, mainly due to its happening before I was born and in a different church tradition than the one I am most familiar with. I also feel you are mischaracterizing my argument that from an administrative perspective, the governing body has an interest in preventing the creation of two classes of MOWS, one that refuses to recognize the other while demanding recognition from the other. In this case, imagine a candidate for ordination who stated in no uncertain terms his/her refusal to recognize an ordained minister because that minister does not meet the candidate's interpretation of G-6.0106(b), screw the Presbytery's interpretation (which is what really matters in the context of the Book of Order). This candidate will IMO have announced his/her intention to violate several elements of the church's constitution in a manner that will undermine the unity of the church. Were I a presbyter, I'd vote against that candidate. We're talking about the Presbyterian Church in specific terms. I don't think it's helpful to muddy the waters by bringing up other faith traditions. Why not bring up Islam as well? It's very popular too. I still believe that a major reason that Presbyterianism isn't more popular in North America (after the many historical accidents which I will not rehash here) is that, when it is authentic, it doesn't try to sell an easy message. We don't tell folks, "just pray this prayer and you'll earn an invite to the greatest party you can imagine after you die. Just shut your mind off, settle back in your stadium seat with your latte and enjoy the show." We do have a bedrock of belief, but we acknowledge that we might not have all the answers and challenge our members to think critically for themselves. As the old Twain saying goes, "there are three kinds of lies: lies, damn lies, and statistics." The latest Petraeus report should reflect this (at the last minute, car bombs were reportedly recategorized from "terrorist attacks" to "traffic accidents"). Membership numbers can easily be interpreted to mean whatever anyone wants them to mean. As I said, I can provide numbers of conservative congregations that have grown and those that have shrunk. I can show numbers for liberal congregations that have grown and those that have shrunk. As far as the denomination as a whole goes, I find it comical that some folks' solution to the falling numbers in the church is to restrict a group of people from joining the life of the church. In this very specific context, mainstream Presbyterianism is allergic to the idea of Fundamentals, and the last time we flirted with it, it did tremendous damage to the church as a whole. As much as I disagree with G-6.0106(b), I acknowledge that it is part of the church's constitution and am working to change that from within the system set up by said constitution. Setting up shadow constitutions, as the "Confessing Church Movement" and the San Diego Presbytery have tried to do, is dangerous and only encourages schism. It encourages the "with us or against us" mentality. Agree with ya 100%. A dear friend of mine is Jamaican and expresses similar frustrations. Hi Jodie, No offense intended. As you probably know, "third world" has a distinct ideological history that developed in the era of decolonization (tiers monde); I don't love it, but it is not necessarily worse than "non-Western," other, "Southern hemisphere," etc, etc. Even "African and Latin American" is pretty iffy as a helpful measure of analysis. It's an interesting language aside in a discussion on language. One thing Jenkins says that I like (I don't always agree with him) is that we tend to use numbers as a stick. In this discussion, numbers have been used to whack at nonconfessionalists, mainliners, fundamentalists, etc. Numbers help us assess trends, but they aren't a measure of righteousness, faithfulness, etc. Just out of curiosity, maybe you can share a bit about your bicultural background. I'm very interested. Thanks all, for an important conversation. What is success in regards to faith?